You already know that the reason you have a diesel generator installation or uninterruptible power supply (UPS) is so your critical loads are supplied in the event of a power outage – if this standby power system doesn’t work when necessary it may mean losing money but if you are a care provider or public institution there could be an even worse outcome. Most diesel generator service contracts plan a visit every 6 months though this can be modified to suit the customer’s requirements. Some sites that are not so critical opt for an annual visit and others go for a monthly inspection. Manufacturers normally specify a service annually or at 400 hours running as a minimum. Diesel generators used as prime power (every day running) should be serviced every 6 weeks or so. Hampshire Generators can do this for you or if you have suitably qualified personnel on site, we can show you how to undertake this yourself. We would then attend twice a year to do the full inspections. WHAT IS INCLUDED IN A DIESEL GENERATOR SERVICE VISIT? Below is a standard inspection check-list from Hampshire Generators – this is often modified to suit the customer’s requirements. Check and adjust as necessary cooling water level, that the anti-freeze solution is adequate and adjust as necessary, check and adjust as necessary the fan belt. Inspect cooling water hoses and tighten hose clips where necessary. Inspect immersion heater for satisfactory operation. Ensure that the battery charging is operating correctly, that the battery electrolyte is at the correct level, top up as required, check specific gravity and measure cold crank amperage (CCA). Check battery terminals are clean, tight and are protected against corrosion with suitable anti-corrosion compound. Inspect and clean as necessary the air cleaner. Inspect and ensure the engine “cold start” heater plug is operating satisfactorily. Test the level and condition of the engine sump oil and replenish as necessary. Inspect and ensure the free operation of the engine governor linkage and that the stop start solenoid functions correctly. Inspect the set generally to ensure the satisfactory tightness of all nuts and bolts. Inspect the electrical control and alternator connections for cleanliness, tighten and ensure all indicator lamps and relays are operating correctly, examine fuses for correct rating and satisfactory condition. Start and run the set off load. Check the satisfactory operation of voltage, frequency, oil pressure, engine cooling system, battery charging, carry out necessary adjustments. Check for any oil, fuel or water leaks. On external sets clean and lubricate locks and hinges. On external sets examine the condition of the weatherproof housing, report only any repair or repainting considered necessary. Record details of the service on “Generator Record Sheet”. Obtain signature of site personnel confirming work has been completed. Optional see below section Each Generator to be load bank tested at 100% rated load for a minimum of one hour. As part of our Environmental Policy and our Generator maintenance ISO14001 management we do not now automatically change the oil and filters every year. Until recently this was the case but disposing of used filters and old engine oil has a significant impact on the environment and we now offer an oil sampling service rather automatic replacement. An oil sample analysis not only shows the condition of the oil but can give in-depth insight into the condition of the engine itself. This can be used to plan diesel generator refurbishment and replacement if necessary. The Hampshire Generator & UPS Company is committed to reducing waste and impacting the environment through our business activities and we show this commitment through having an external, independent audit of our Environmental Policy every 12 months. One of the main things our customers tell us is that they require the generator maintenance record sheet to be sent promptly and to include any recommended remedials with prices as soon as possible. We endeavour to send service records and quotations the same day; so you as a customer are aware of any issues immediately and how much money it will cost. This puts you in control of the decision. DIESEL GENERATOR SERVICE CONTRACT PRICES. We do have some standard single visit pricing on our website here – Generator Maintenance Prices – but we find that each customer needs a slightly different level of service so we try and tailor our packages. We can put together a quotation very quickly so it is worth giving us a call to discuss your requirements. The only true way of knowing your system functions correctly is by performing a full ‘black building’ mains failure test. This will show you exactly what happens when the power goes out. Hampshire Generators can arrange this for you at a time that suits you as a business – probably outside of business hours. We can then give you recommendations on how to improve the system or rectify any diesel generator faults. If a full mains failure test is impossible then an annual load bank test is recommended. Diesel generators are not designed to be run on light load and regular ‘off load’ testing or running can cause carbon deposit build-up, oil weeping / leaks and other smoky problems. We will be soon having a full blog post on this subject so keep an eye out for that! 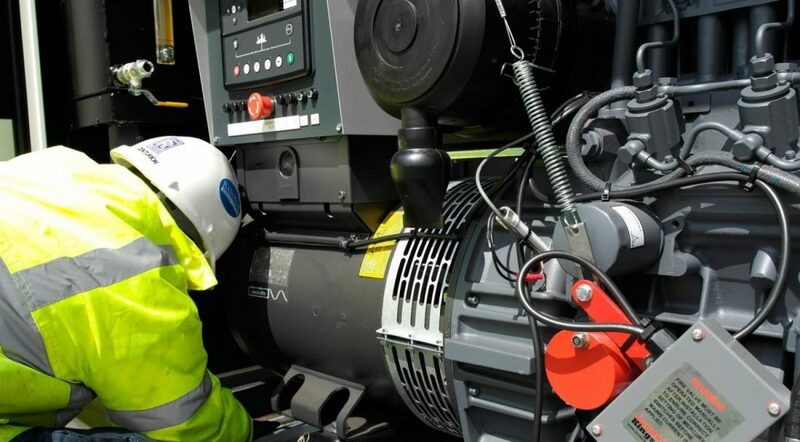 The Hampshire Generator & UPS Company provides diesel and petrol generator sales, installation, service and repair and covers the entire range from less than 1kVA to over 3000kVA. Owned and managed by engineers with decades of experience and a passion for standby power projects – Call us on 01329 722390 or email [email protected] for more information.